A few days after taking the Certified Cicerone test, I still have no clue what just happened to me! They said they’ve recently been getting test results out around 4-6 weeks after the test. So I’m starting this horrible waiting game! I went from feeling confident while filling out the first 5-6 pages of the test, to feeling like I knew nothing filling out the next few pages that I left speckled with blanks to return to, to feeling great after taking the tasting portion. When I left the exam, I was feeling that it could go either way. I got home and immediately pulled out my note cards to verify that I had answered certain questions correctly. Another roller coaster of feeling good and bad. And it slowly turned to bad. I put away my notecards, not wanting to discover that I had answered anything else wrong. I had only gotten half of it correct. I awoke the next morning not feeling much better. I started to feel that I had answered one of the essays incorrectly, but I didn’t even want to look up the style guidelines for the answer. Several hours later, my OCD got the best of me, and I looked. I felt great! For at least the past 24 hours, I’ve remained confidently certain that I had A SHOT at passing. So I’m going to do my best to stick with that! As most of you know, I’ve been studying for this test for quite some time now. I’m far more knowledgeable now than I was even at this point last year. There’s so much to learn. And the more I learn, the more I know I’ll never stop. I knew I wanted to take the test this year. Three months ago, my husband texted me telling me an exam date had just popped up in our area. I was like a kid on Christmas. That was what I needed to hear. I immediately created a spreadsheet to log my hours of studying each day, and I immediately started making notecards and started reading my beer books with a renewed purpose. Ben had intended to take the test, too. About a month before the test, I started to have doubts that I would be ready. I went home to tell Ben, and he beat me to the punch. I told him I felt the same way, and he argued, saying, “No. You’re ready.” So I buried myself further in notecards, books, and obviously, beers. Ben and I registered for the test. The days passed quickly. And there we were. Sitting in front of the local distributor where the test was being administered. A guy in the car beside us was speeding through notecards. Ben and I wondered how many people would be taking the test with us. We made a pretty fair bet that there wouldn’t be any other married couples in there! There were about 20 of us. All of them in the industry except for Ben and me. Most of them were taking the test for the second or third time. And there was only one other woman. So let’s talk about what a Cicerone actually is! There are 3 levels in the Cicerone Program. The first is a Certified Beer Server. The second is the Certified Cicerone. And the third is the Master Cicerone. In the proper use of these terms, Certified Beer Servers cannot call themselves “Cicerones”. This is reserved for the Certified Cicerones and Master Cicerones. They’re typically to be referred to as a “Certified Beer Server in the Cicerone Program”. People in the beer industry know what a Cicerone is. And a lot of geeky beer geeks know, too. But it’s something I often find myself explaining to the rest of the world. To inquiring minds, I explain it in its basic sense as a Sommelier, but for the beer world. The Cicerone program has become the industry standard in certification programs. It’s basically a certification that you have extensive knowledge of all that is beer. I’ll sometimes describe it as a type of “beer expert”, but I think that phrase is best reserved for Master Cicerones. And I think the minute you think of yourself as an expert, you’ve done a disservice to yourself. There’s so much to learn! Master Cicerones are expected to have an encyclopedic knowledge of all that is beer. There are only 9 Master Cicerones in the world! I hope that one day I would be ambitious enough to take that on. But I definitely don’t have a plan to accomplish that at the moment! First things first! I have to pass the Certified Cicerone test! Around 200 people become Certified Cicerones each year. One in three people at each exam fail the test, making this harder to pass than the bar exam! And those statistics may have changed some since an outside party last published them. It’s a little pricey to take, but certainly affordable if you’re passionate about beer. If the test was cheap to take, I’m sure there would be far more attempts and far more failures. I feel the price is very reasonable in comparison. If you pass one portion, you don’t have to retake it, and you just pay a smaller amount to retake the portion you didn’t pass. The written portion is 3 hours long and is comprised mainly of fill-in-the-blank questions. There is no word bank. There’s no way to really guess your way through it. You truly have to have a great understanding of all things beer. There were several small matching portions with word banks from which to choose, but you can’t count on those few parts to be your saving grace. An old version of the Cicerone test is posted on the cicerone.org website and is available to registered users. It shows one of these word bank questions to be about matching beer glasses with the appropriate styles of beer. Take that for what it’s worth. I had planned to divulge as much information as possible after the test to help people who were considering taking the test. However… before the test, you sign a waiver that says you won’t divulge any explicitly detailed information about the exam. Doing so can be cause to be stripped of your certification. With that being said, I just can’t answer all of the questions people have. But I can definitely break the test down a little bit and point out some important things to know. I also very highly recommend that anyone interested in taking the Certified Cicerone test purchase a study guide from thebeerscholar.com. 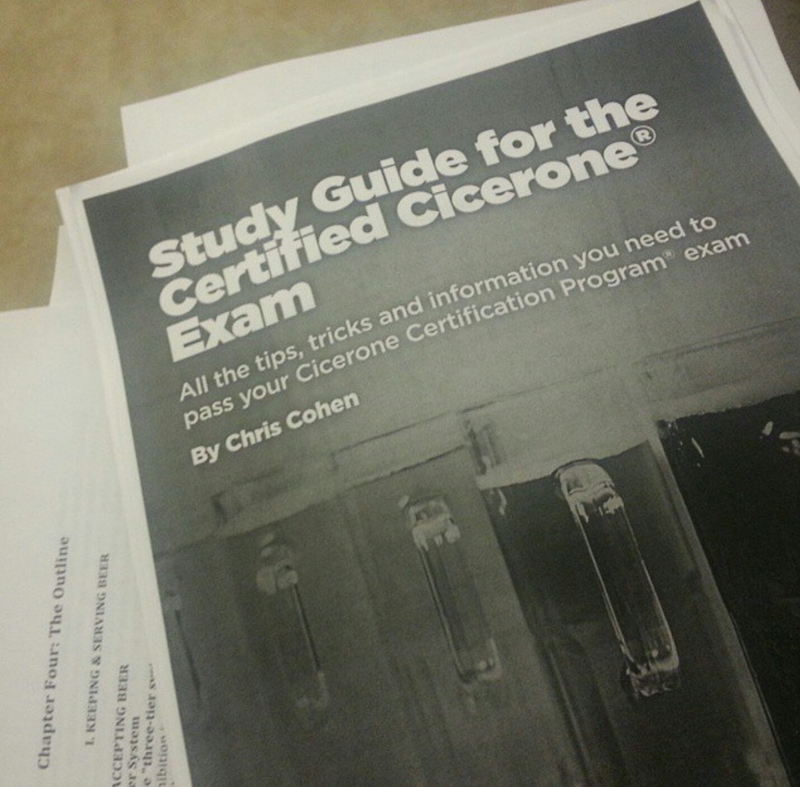 Chris Cohen, who wrote that particular study guide, did so independently of the Cicerone Program. Both Ben and I found it to be very helpful. It also comes with notecards that aid in pounding the info into your head! I carried those with me all the time. Randy Mosher’s Tasting Beer is a MUST read. I read it for the first time a while back and felt that it was a good bit over my head. But you retain some of that knowledge. And as you study more, you find yourself going back to Tasting Beer to reference things. It’s really the most conclusive reference material for all things beer – from history, to ingredients, to brewing processes, to styles, glassware, etc. After reading other books and Chris Cohen’s study guide, I reread this book. And it alllllllllllll made sense. It was no longer over my head. Instead, it was this awesomely cohesive gelatin that formed fragments of knowledge together. I absolutely recommend this as a reread right before the test as well, even if you skip parts you’re more familiar with. 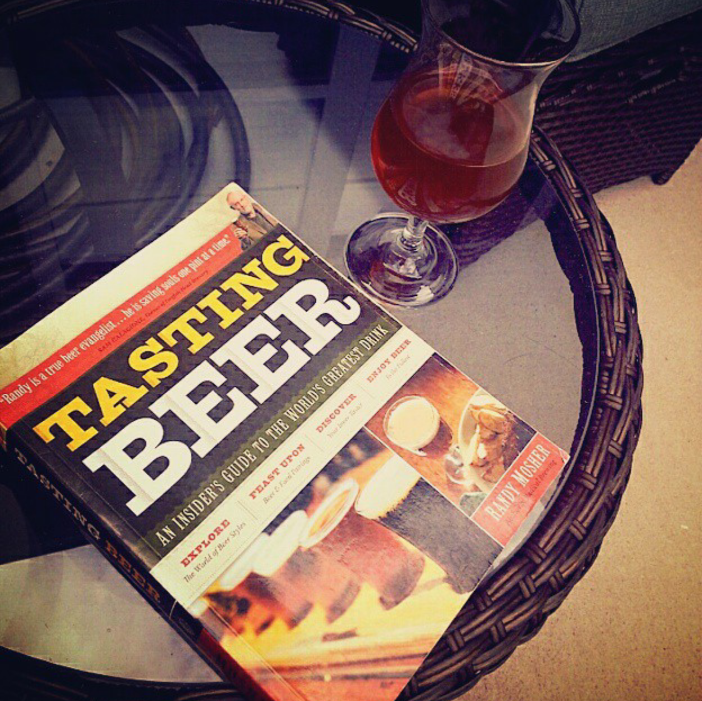 The Complete Beer Course by Joshua Bernstein is a little more approachable than Tasting Beer. I picked it up after having read Tasting Beer feeling little overwhelmed. Bernstein has a really approachable take on everything. And parts of his book were particularly helpful to me! There are some good nuggets in there. Included in the written portion of the test (which is 20 pages long, FYI) are 3 long essay questions. These questions are worth substantially more, and doing well on them is important. I feel very confident about my answers for all three of them! That may be my saving grace! I know I missed a few opportunities for all of the points on the essays here or there for reasons I won’t go into, as it may be easy to figure out what the essay question was, but I feel really good about my answers in general! There were around 150 questions plus the essays. It took me all 3 hours for this part of the test, though Ben actually finished first, with maybe 45 minutes to spare. I also feel good about the tasting portion of the test. You have to get a 70% or higher to pass the tasting portion. There are 12 questions. The tasting portion is broken down into 3 parts, and you have 45 minutes, which is more than enough time to complete this portion. There are 3 sets of 4 beers. The first set involves off-flavors. You were given a control beer, and then asked to determine which beer in the group of 4 matched the control. Then you had to choose the off-flavors in the other 3 beers from a list. The next set presents 4 different beers for which you have to choose the correct style. There will be 2 styles listed that are pretty closely related, and you must choose one. The last set also involves off-flavors. But these 4 beers are presented to you along with the name of the beer style and brand, and you are asked to determine if the beer is fit to serve. If the answer is no, you have to name what is wrong with the beer and what caused the problem. This last set is worth half of the tasting grade, as it involves more detail and multiple parts in the answer. The tasting portion was administered last and in a group setting. Each person had their own table with their beers and test paper in front of them. Obviously, discussion was not allowed. (It’s noteworthy that we did get bottled water and were offered saltines for the tasting if we wanted them.) At the end of the test, the proctor told us the answers to the tasting portion, even down to naming the exact beer that was used in the style delineation. Again, I was kicking myself! I could remember my choices for the middle set of 4 and the last set of 4, but I couldn’t remember the exact order I placed the first 4 in. I got the naming of the styles section all correct and missed 1 of the 4 in the last set, which I’m still beating myself up over. I doubted what I thought I initially tasted, but I stuck with the whole “go with your first reaction” thing. If I had just answered that correctly, I would know right now that I had passed the tasting portion. From the first set of 4 beers, I know that I got the second beer correct and the fourth beer wrong. I named the correct things for the other 2 beers, but didn’t remember if I had reversed them. So it’s killing me to not know. Ben and I had 2 off-flavor tasting kits (we purchased one through the Cicerone Program). These helped IMMENSLEY. It’s one thing to think you know what creamed corn (DMS) would taste like in a beer; it’s another to actually be able to pull that taste from a beer. Plus, that off-flavor can also taste like cooked vegetables or green beans to some people. It tastes more like green beans to me! So if I was blindly searching for creamed corn, I would have been out of luck! In our own off-flavor tastings, we discovered what flavors were difficult for each of us to pull out. I had the most problems with detecting acetaldehyde, and Ben struggled with diacetyl. (Geeks!) In our first off-flavor tasting, I only got half of the flavors correct. In the second, I nailed them all. So I highly recommend any prospective test-takers purchase an off-flavor kit. These are pretty pricey. But all that time you spent preparing for the test is extremely valuable, too! And you’re also forking over a chunk of change to take the test. So just splurge and order an off-flavor kit. I could show someone what diacetyl and acetic acid taste like in a beer for free if they wished! These two flavors combined equal a draft line infection. Yum! The very first beer Ben and I had after our exam (at a local place to remain unnamed) was poured by some definite offenders of not cleaning their draft lines! That beer was extremely different from what it should have tasted like. And it makes me sad to know that some people will judge that brewery and their beer based on that flavor caused by the negligence of a bar. The test requires the previously stated 70% or higher score on the tasting portion, and a score of 80% overall. Being that it was my goal for this year to become a Certified Cicerone, I’m going to do everything I can to ensure I accomplish that. I took the test on June 15th. The only other test scheduled through the beginning of next year within a day’s drive back and forth of my home is on August 31st in Virginia. So… I took a break from studying for a few days, and I’m back at it again! If I fail a portion of or all of this test, I want to be prepared to take it again! I’ll keep you posted! I failed my driver’s test the first time, but I pretty much nailed it from there. So, perhaps the same will hold true for you here! 8/3/15 Update! The Cicerone Program today announced the upcoming addition of a new certification level – the Advanced Cicerone! The study guide is set to be introduced in September, and exams will begin early in 2016. This certification will be introduced as the level between the Certified Cicerone and Master Cicerone classifications. Hey there! Thanks for your kind words about my Beer Scholar Study Guide for the Certified Cicerone Exam! Sounds like you’ve found it to be very helpful. It always makes me happy to see a good review out there in the wild 🙂 If you ever have any questions about the Cicerone exams please email and let me know. Cheers! Thanks a bunch, Chris! My husband took the test with me also and I know he emailed you about how much the study guide helped him. He passed! And I just passed the tasting. Now I know what to expect when I take it again soon. Cheers! You’re in a great position, really – it’s usually the tasting portion that causes people so much trouble. Good luck knocking out the written portion on your next go and congrats to your man for passing! If you’re ever in San Francisco look me up. Cheers! Again, thanks a bunch. And we will!